Hello everyone! I am so glad you dropped by…. I could really use a break. I finally tackled some projects that have been on my very long to-do list. Let me show you some of what I have been up to. This is our dining room now. This was what the chairs looked like before I recovered them. An electric staple gun was a must on this project. There is a funny story about buying this set off Craigslist. I purchased the dining table, six chairs and a buffet for $300. I contacted the seller by email and he told me his real estate agent would meet me. I drive up to this gorgeous home in Destin, Fl. I am talking about at least a two million dollar plus home. The real estate shows up and I pay him for the set and make arrangements to pick it up the next day. I show up the next day with the two men I hired to deliver the furniture. The real estate agent tells me the owner is awaiting trial for tax evasion, money laundering, racketeering and several other charges. His business partner had already been sentenced to 30 years in prison and the seller expected a similar sentence. He was currently out on bond and was trying to liquidate everything before going to prison. While we are loading the furniture the home owner calls his agent. He makes us unload the buffet in the driveway and has the agent pulling out all the drawers and looking inside while still on the phone with the him. The seller keeps telling him to look again, and again, and again. The agent is getting very annoyed by this time and starts yelling that there is nothing inside the buffet. They hang up and just a couple minutes later the owner calls again and tells the agent to pull out all the drawers and check the bottom of each one. The seller calls a third time and this time wants the movers to flip the buffet so the agent can see the bottom. When I finally got the set home hubby and I tore the buffet apart looking for the missing item. I was praying we wouldn’t find an envelope with drugs or anything else illegal. I worried for a couple of weeks that the seller might track me down and send some goon to retrieve his missing item. You never know what you will encounter when buying off Craigslist! If you are still with me after this really long post can you guess what my next project is? Here is a hint. That is really crazy!!! lol!!! Love your new furniture!!!! Sherry, what a cute story. Glad no one came after you. I love the furniture and your dining room. I could just pack up and move into your house from what I have seen. BTW when you tire of the basket on the wall you can send it my way. I have been wanting one for quite some time. Very funny story…great looking dining room set!! I think half the fun of buying off Craigslist are the people you meet and the homes you go to but your story really tops them all, doesn't it? Great job on the chairs. I love those spindles. ohh! I would worry too. Oh my! my husband once showed an apartment when we were managing… he walked in and saw a gun and lots of money on the table, closed the door and told the perspective renter he would show him another apt. YOu just never know!! But it is a beautiful piece! 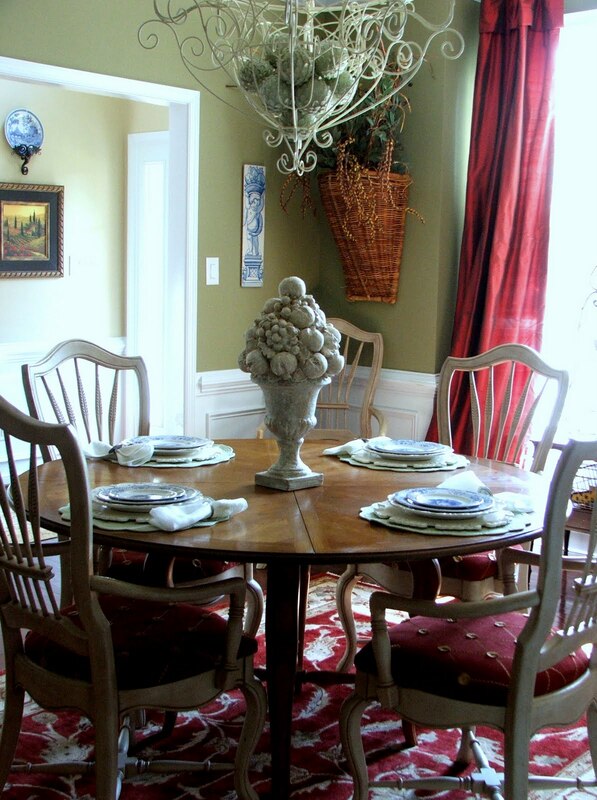 You've got a great story to tell now whenever you host a dinner party in that gorgeous room. Love the furniture and what a creepy story!! You just never know what people will do for money! Glad everything is safe and sound. Dang Sherry! I was just waiting to read the part where you found a thick envelope filled with hundred dollar bills!! Great story. Oh and my guess is the buffet is getting some color. Oh my gosh…what a story! I wouldn't know whether to laugh or start looking over my shoulder! You did get a great deal! Great story! I'm glad you out of there safely. Your dining room is beautiful. So you never found anything? What a bizarre story! Looks like you purchased some great looking furniture! Incredible!! I love the colors you've decided on. Beautiful. A very lovely Dining room and you did a wonderful job on those chairs. I like the chandelier from what I can of the bottom part…. hmmm I wonder if there is another picture of that. I was peeking through some of your older posts and I noticed that I hadn't commented on your beautiful room! I love it! I can't believe you found such a beautiful set for such a great deal…amazing! Everything in this room is just stunning! I adore the basket on the wall too! I noticed Kim has her eye on it…she can't have it;)! If you ever tire of it..it's mine and you can throw in the chandy just for good measure! Your dining room is gorgeous!! What an adorable blog! Your story makes that buffet even more special! You really made it into a beautiful piece! Thanks for visiting my blog and being the first to comment! Yay – you know how exciting that can be when you first get started – Thanks!